Hint: Use a graphing calculator to help solve this problem. Given: A projectile is launched upward at a velocity of 370 ft/sec on Earth. 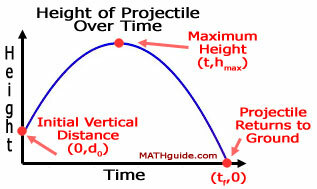 The projectile starts at an initial vertical distance of 80 feet. Find: a) Write the function that describes the height of the projectile with respect to time. b) At what time does the projectile reach the maximum height? c) Determine the maximum height of the projectile. d) At what time does the projectile reach ground level?